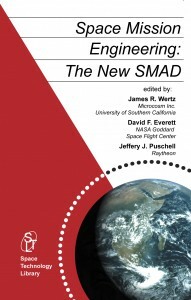 Completely rewritten, updated, and expanded follow-on to the 3rd edition of Space Mission Analysis and Design, the most widely used text and reference in astronautics, covering a great many topics not previously covered, such as CubeSats, Inflatable Structures, Space Economics, End-of-Mission options, Space System Risk Analysis, and new, much more precise formulas for ground station and target coverage. Downloadable electronic spreadsheets for most of the numerical tables and plots in the book that let you, for example, calculate all of the critical parameters for orbits about the Sun, Moon, Earth, and any of the other planets, or even new planets, moons, or stars of your choosing. An annotated bibliography and references on the web that is updated as new references become available and that shows you where to get nearly all of the references — with direct links for those available at no cost and where on the web to buy copyright books and professional papers not available for free. All of the cross-referencing, careful definitions, and thoroughly explained equations that are the key ingredient of any high-quality engineering text or reference, along with the wisdom and experience gained at substantial cost by some of most experienced and knowledgeable space system engineers in the world. Want to talk to a real human being that can spell astronautics about the problem you need to solve? Send an E-mail inquiry about this book to bookproject@smad.com or astronautics books in general to bookstore@smad.com, visit one of the associated websites (www.smad-sme.com or www.astrobooks.com), or call us at 1-310-219-2700 or 1-888-ASTROBK.Want to get in touch with one of the authors, report a possible error, or find the reference you need? Call, or send us an E-mail. It’s a small community, and we’re here to help you find what you need to get the job done. For educators, we provide a complete Educator Package with all of the charts, figures, and photos in the book, in color and high resolution to provide the best educational experience for your students. we are a spanish bookseller, and need one copy of that book… could you help us please? Please visit Astrobooks.com for your purchasing and shipping needs. They will give you the best prices on all our titles.